Named after Joseph Ellicott, who laid out the village of New Amsterdam (now Buffalo), the Ellicott Square Building was opened in 1896 after only one year of construction. The building, which occupies an entire city block, was the largest commercial office structure in the world at the time. 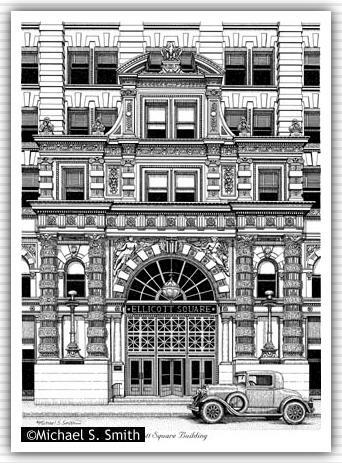 The drawing shows the Washington Street entrance, highlighting the elaborate terra-cotta exterior.